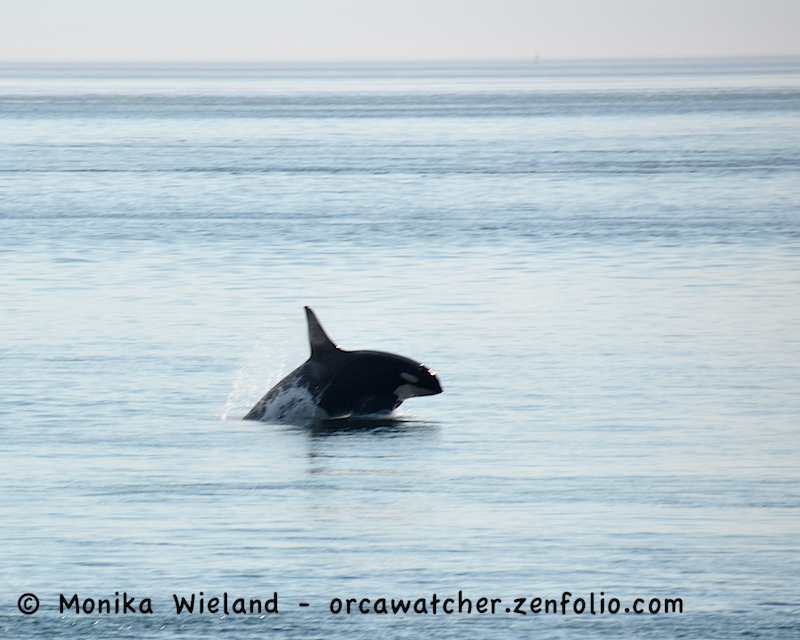 Orca Watcher: First Superpod of the Year! On the afternoon of July 8th we got the news we had long been waiting for: superpod inbound! For those not familiar with the lingo, this means all three pods (J, K, and L) were coming in from the ocean through the Strait of Juan de Fuca towards San Juan Island. The last four weeks have been pretty sparse when it comes to sightings of our Southern Resident Killer Whales. After an amazing stretch of J-Pod encounters in early June, they took off and had been gone for almost a month, which is almost unheard of this time of year. 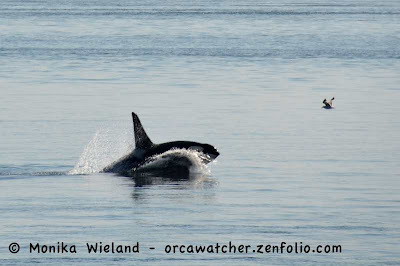 K-Pod hadn't been seen in inland waters at all yet in 2013. L-Pod had made a few brief appearances, but recently the only whales around were the three members of the L22 matriline, which was in itself odd since they usually travel with the rest of the L12 sub-pod. So where are the whales when they're not here? The short answer is that we don't know, other than that they're somewhere on the outer coast in the open ocean where sighting reports are few and far between. After weeks of hoping and waiting it felt like the summer could finally begin! 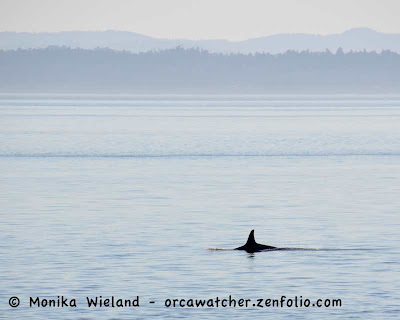 I was lucky to be able to leave work a little early to go out to the west side of the island, where I arrived at Land Bank's Westside Preserve just as the first few whales did. I proceeded to watch them for the next three hours as they slowly made their way north. Needless to say, they were super super spread out over 10-15 miles or more! They were all pretty far offshore, but it was still a treat to be able to see so many whales, and in the calm waters they were easy to see and also hear. 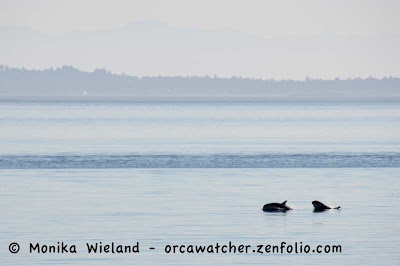 Not all the whales went north, but my estimate is about 60 did, including members of all three pods. 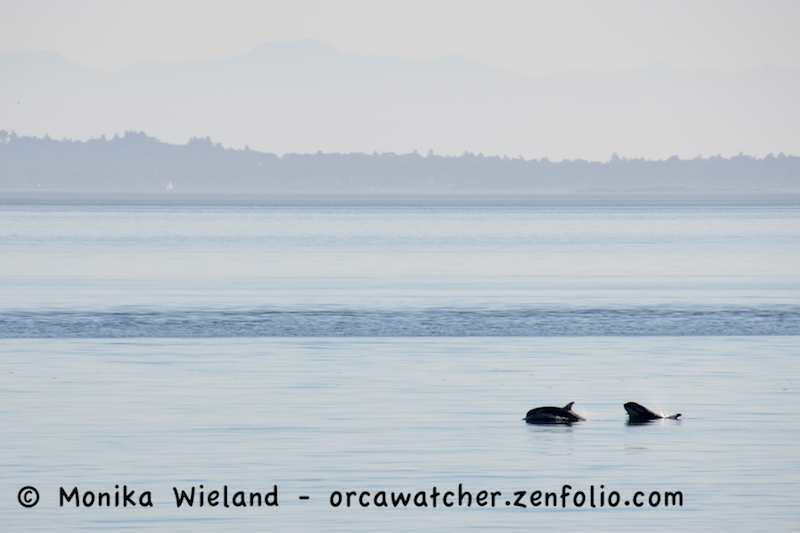 For the last hour or so a group of L-Pod whales was just lazing around in the current, facing south but not really going anywhere against the strong flood tide. 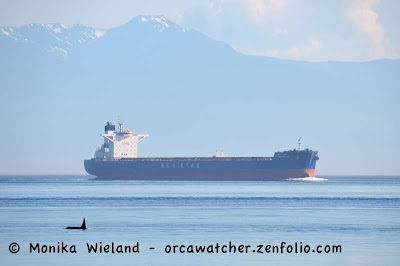 I must admit, it's been a bit hard to watch the entire whale-watching fleet on the three L22s over the previous week. 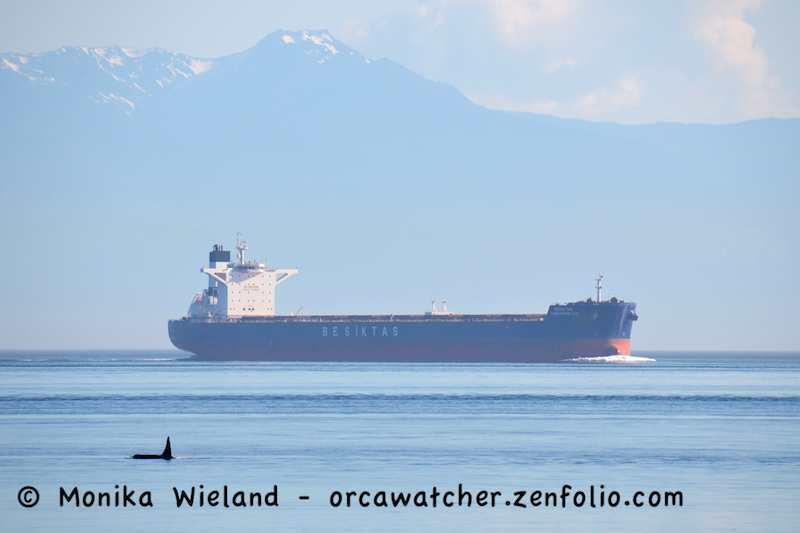 With all the whales back, the boats were spread out with different groups of whales, and for most of the time I was watching, there weren't any boats at all with the whales passing by. 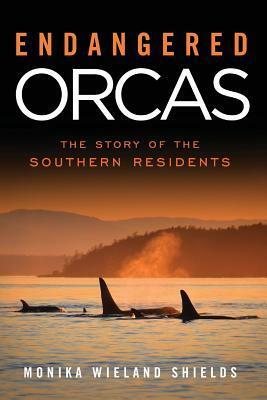 It's thrilling to see the whales up close, there's no doubt about that. But there's something really fulfilling, too, about encounters like this, where they are far away but everything is so peaceful. Some animals were foraging, but others were playful, breaching and tail slapping, simply enjoying each other's company or perhaps just happy to be back in their summer home. Now let's just hope there's enough fish here for the whales to stick around for a while!